Ziconic in his February 20 debut. Photo by Zoe Metz. Ziconic will make his second start this Friday, March 25. He is entered in Race 4 at Santa Anita Park, a 1 1/16 mile maiden race. Mike Smith will be riding. Post time is approximately 5:30 pm ET. We’ll be watching with Zenyatta from Lane’s End! Good Luck Ziconic and may all horses and riders come back safe. I will be watching you on Cal Racing. I wish I could be there in person. There will be many of your Mom’s fans cheering you on to victory. 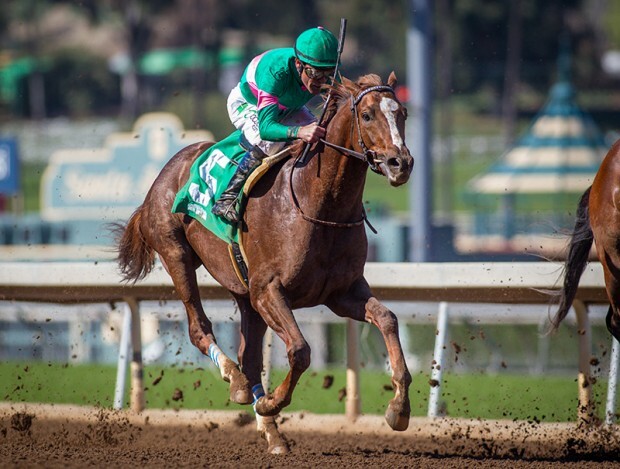 If you want to watch Ziconic live on Friday, it is available Live-Streaming from Santa Anita. You will need to create an account, but it’s free. Here’s the link. GO ZICONIC!! Back to school. He missed the break COMPLETELY. Zi broke with the wrong foot, which forced him into the right side of the gate. The race was over at the breeak for our guy, so it’s back to school to learn how to get out of the gate! Not sure that was his fault. I have a lot of hope for Ziconic so bad luck there. Run like the Wind, Ziconic! You have what it takes to be GREAT. I’ll be watching on TVG, Ziconic, and cheering for you ALL THE WAY!! God Speed – Ziconic and Mike. Will be watching and praying for both of you. Praying for your Mom’s easy and safe delivery. I have searched the Internet and Santa Anita Park for results of Ziconic’s race, but have been unsuccessful. Does anyone have any info??? Some fans are calling for a new trainer. I do not understand by Ziconic and Cosmic One are not entering more races. HAPPY BIRTHDAY TO COSMIC ONE!! I was @ Santa Anita to support & cheer for you (as I did for your debut), and I must say: you are quite the hunk! I recorded you coming into the paddock, in the saddling barn, and your race. Now I can watch YOU over & over because I LOVE YOU!! I can hear myself yelling for you and Mike :-) I will always go to the track to cheer for you. p.s. I handed Dottie your birthday card since she was standing near me in the saddling barn :-) I wish you a very special birthday, Sweetie!! Why change jockeys? Seems like an error to me. He ran for Gary Stevens. Of course the pre-race stuff was unfortunate. I think he will be a great winner once he sorts himself out. Zernyatta’s dislike of the starting gate seems to be Ziconic’s problem, too? Ever heard of Pat Parelli? He can teach Ziconic that the starting gate is a fine place to be and a great place from which to run. Maybe it’s not the genes, but the initial training?